This 47 Piece Over N' Under Pier Set was Designed by Atlas Model Railroad To Take Your HO Scale Track Layout to New Levels. Retail $23.95 SAVE 24% ! Light gray plastic construction with stone masonry details. 46 piers and a pier girder. Piers are graduated in height from 1/4" to 3" by 1/4" increments, with 1/8" snap-in shims provided for intermediate piers. Approximate grades up and down in figure-8 arrangement using 18" radius curves is 2.6%. Recommended for use with Atlas HO Code 100 and Code 83 Snap-Track. 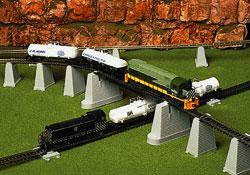 Gradually raise track over other track or roads on your HO scale layout.